Anyone for Beef Cheek Stew? 1. Trim the beef cheeks and remove as much sinew as possible (your butcher can do this for you). Cut each cheek in half. Season well with salt and pepper. Heat 2 tablespoons of oil in a heavy-based pan and brown the cheeks on all sides. Remove and set aside. 2. Add the vegetables, garlic, anchovies and a little extra oil if necessary. Stir around until they turn golden. Add the thyme and peppercorns and mix everything together. When all the vegetables are golden, add the tomato paste and cook for 2 minutes. 3. Pour in the red wine and stir, scraping up all the sticky bits from the bottom of the pan, then cook until the liquid is reduced and you have a sticky sauce - about 12-14 minutes. 4. Put the beef cheeks back in the pan and cover with the chicken stock. Bring to the boil and cover with a circle of greaseproof paper. Cook the beef in the oven at 150C/130C fan/gas 2 for about 3 hours or until tender. 5. Once the cheeks are cooked add a splash of balsamic vinegar and Worcestershire sauce. Carve the cheeks into smaller portions if necessary. This is lovely if served with dumplings (175g self raising flour, 75g suet, season , add ‘just’ enough water to form in to about 12 dumplings). Pop on top of stew for 30 mins at 200 degrees C.
Also good with mashed potato and lots of steamed greens. Seriously, the best beef stew you will have ever had! New Meat Selection boxes available to order soon!!! Please note that our final delivery day prior to Christmas Day will be Friday 20th December. Orders for delivery on the 20th December will need to be placed at the latest by 11am on Wednesday 18th December to ensure delivery. Unfortunately we cannot ensure that orders placed after this time will be delivered. Delivery is available on Tuesday the 31st December - Please place your order before 11am on Friday 27th December. Orders can of course be placed in advance for Christmas and New Year just let us know what day you would like your delivery in the 'Special Instructions' box before the checkout. I am a very lucky girl to have been sent some amazing meat to try today from Pimlotts butchers in Cheadle Hulme, Manchester. A big box was waiting for me when I got home this lunchtime from the playgroup run, and in it were some cumberland sausages, some shin of beef, and a shoulder of lamb too. Couldn't have picked better cuts myself. They came in the nick of time, as the toddler literally had just requested sausages for lunch, with me saying we didn't have any in! Hence, we made posh sausage sandwiches... I know it's not a recipe as such, but I thought the combination of ingredients worth sharing as it makes a tasty, quick, easy lunch. Do I really have to state the obvious advantages of buying from a butcher? OK then, I will. High quality produce; traceability; a friendly and knowledgeable service; competitive pricing; high welfare standards; wide range of produce and cuts; specialist meats and cuts on request; helping to support your local high street... I get why so many of us shop at supermarkets; we are all very busy and it's more convenient to shop there and get everything in one go (I have an expensive Ocado habit myself). But when it comes to meat I almost always go to a butcher. It's unthinkable for me to imagine living somewhere where there isn't a very high quality butchers (or fishmonger's for that matter) within walking distance. If I lived in Cheadle, Pimlotts would be it. Having only tried the sausages so far I can't yet comment on their lamb and beef but I expect I am in for a treat... By the way, Pimlotts offer online shopping so there really is no excuse for not taking advantage of a great butcher, even if you do live miles from a decent one. So, back to the sarnie. I had a couple of apples in the fruit bowl. Some sage leaves in the garden. English Mustard and mayo in the fridge. Some ciabatta rolls left over from last night's bean burgers. In minutes I had a really rather nice lunch. 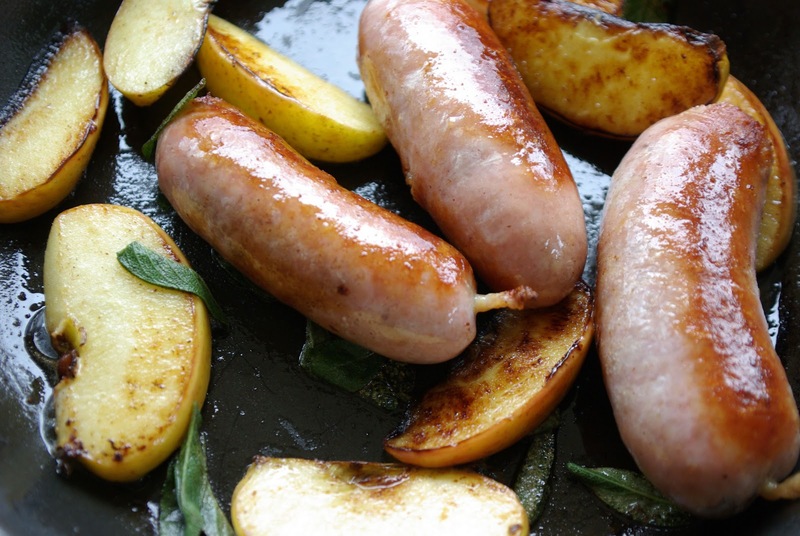 Fry your sausages as slowly as possible in a frying pan over a low heat. 20 minutes should be about right. Then, once they are about 5 minutes off, add your sage leaves and apple slices and frazzle them off in with the bangers. Lightly toast a your sliced ciabatta and generously smear with mustard mayo on both sides. 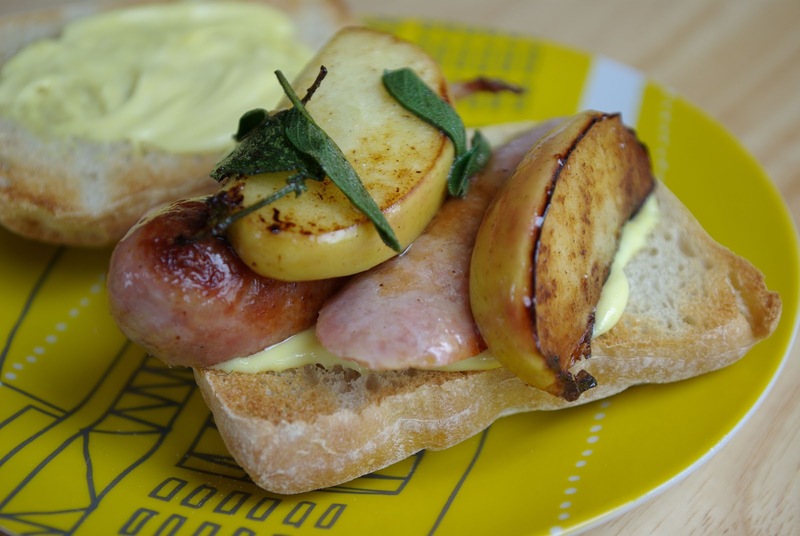 Slice sausages in half and arrange on the slices with the apple and sage too. What a week it's been! We've been interviewed on BBC Radio Manchester and also on BBC Breakfast News, yes on THE red sofa!! All because of the on-going Horse Meat Scandal which is expected to be more widespread than was first thought. Buying from your local butcher has always been much more economical than buying 'Ready Meals' judging on the meat content that many of these 'value' meals actually have in them. Here at Pimlotts we can also guarantee full traceability of our meat right back to the farm gate. For those who are 'time poor' there are lots of quick and easy options available such as Stir Frys, Ready Marinated Chicken or Lamb, and what could be easier than grilling a gorgeous juicy Steak? Just check out the Midweek Meals sections of the website for some tasty ideas. If you have a favourite quick and easy recipe why not send it to us and we'll publish it here. If you'd like to listen to Richard, Paul and Frank on the radio click on the link below. We're hoping to have a link for the BBC Breakfast interview shortly. The Chinese New Year is celebrated by eating special New Year food, setting off fireworks, visiting friends and relatives, delivering red packages and hanging lanterns. Many Chinese people wear red as they believe red is a lucky colour that wards off evil spirits. To get you into the spirit of things this weekend, why not try this very simple recipe? This spicy chicken recipe gets its heat from Tabasco sauce, cayenne pepper and crushed chilies. Parboiling or "oil poaching" the chicken in hot oil helps make it extra tender. Combine the sauce ingredients in a small bowl and set aside. Whisk the cornstarch into the egg whites. Coat the chicken strips in the cornstarch mixture. Heat 1 cup oil in the wok. Cook the chicken strips briefly in the hot oil until they turn white. Remove the chicken and drain on paper towels. Clean out the wok and add 1 tablespoon oil. When the oil is hot, add the carrots stir fry briefly and add the peppers. Make a "well" in the middle of the wok and add the sauce. Heat briefly, then mix the sauce in with the vegetables. Return the chicken to the wok. Stir-fry 1 to 2 more minutes. Stir in the green onions. Serve with rice. Thanks for coming along to check out our new website. We hope that you'll be able to find all the things here that you like so much in the shop, but now be able to order them when getting to us is proving a bit of a challenge. And if you're new to us - it's great to meet you! We'll be supplying the people of the local area, and customers all over the UK, with the same personal service and reliability you expect from your local butcher. All our farm assured meat is now available on-line, and if you need to ask a question or have a special request, then you can do that here too. Keep reading the blog as well - we'll be posting up some hints, tips, and all sorts of things we find interesting about the world of butchery and food. You'll also find some recipes from our Master Butchers, telling you how to cook certain pieces of meat. You never know, you might get introduced to a method you've never considered before!